Kathryn’s love for food and cooking first began in her Fisher Price kitchen as a child and continued as she grew. In 2001, her dream of becoming a chef became a reality when she graduated from the Culinary Institute of America, Hyde Park, NY. In 2001, Kathryn was hired as a line cook for the Hyatt Regency Hotel Restaurant Market Street Bar & Grill. Her career advanced when she began creating menus and wine pairing dinners featuring Walter Shug’s vineyards, and then creating a six course beer pairing dinner featuring Sam Adams Beer. After countless events from weddings to tastings, Kathryn went from being the line cook to becoming the Sous Chef for Garde Manager and the Culinary Supervisor for the restaurant. In 2009, she left the Hyatt Regency to gain more experience and was hired with Falcon’s Landing Air Force Retirement Community. At Falcons Landing, she developed creative brunches and brought back classic dishes to its patrons. During her tenure there, she worked with the Falcon Landing Ladies to publish a cookbook featuring their favorite recipes. Kathryn remained with Falcons Landing until her return to Hyatt Regency Market Street Bar & Grill. In 2012, Kathryn joined the Sugar Creek Restaurant team and the move enabled her to enjoy the Outer Banks lifestyle while honing her skills in Regional American and seafood cuisine. She enjoyed a busy and active array of Chef duties while there. 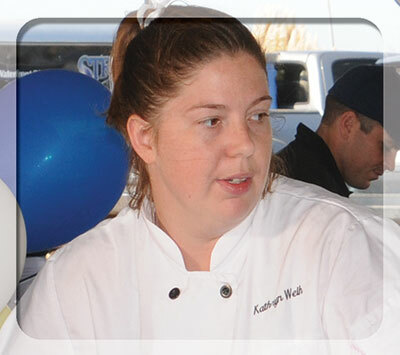 In 2015, Kathryn moved to Chef at captain George’s Seafood Restaurant in Kill Devil Hills, also an OBRA member.